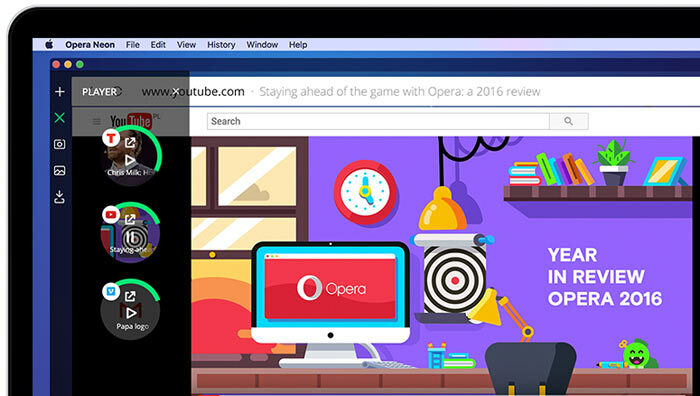 Opera Software has released a new concept browser that it says provides "a glimpse into the future of desktop browsers". The project started a year ago with the aim of imagining what browsers will look like in the future, as the popular browser programs used by the majority of net surfers nowadays "are not as fresh as they used to be". Opera Neon is the new concept browser and was distilled from thousands of concepts, drawings, iterations, versions and interface designs from teams of talented developers and designers. Opera suggests its new Neon browser, built upon its Blink Engine, will show you the future in the same way that concept cars are a window on the future of automobile design. An intelligent system that automatically manages your tabs. Like gravity, frequently used tabs will float to the top, while less important tabs will sink to the bottom. Rather than treating the web "like documents in a briefcase" the Opera Neon designers sought to highlight the content people enjoy most and have thus included new ways to enjoy things like videos in a minimal popout, implementing a snapshot / clipping gallery, and an in-browser split screen mode for multi-page interactivity. Have a look at the video near the top of the article, to hear about Opera Neon development and to see it in action before you decide to try it for yourself. Opera makes it clear that it doesn't expect users to adopt Neon as their main browser and it is missing regular Opera features such as; the native ad-blocker, VPN, and the ability to add extensions at this time. 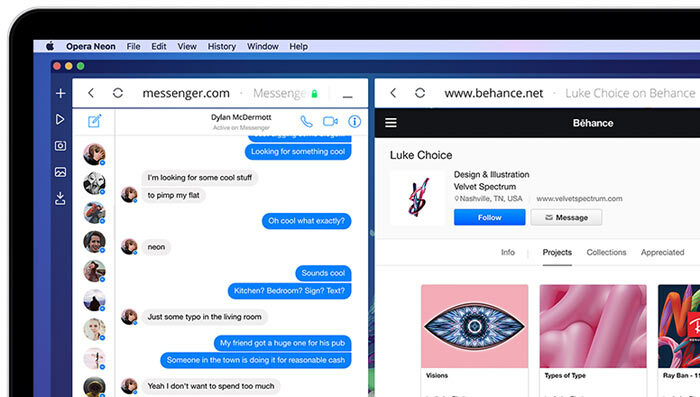 However, from spring this year, users will begin to see some of the best Neon features incorporated into Opera for computers. That's sarcastic right? (Hate text for not being able to tell these things). All browsers need to do IMO is work better full-screen on widescreen and ultra-widescreen monitors. Currently extensions work for splitting, it should be built-in. I guess they thought that vertical tabs were one way to use this space sensibly? TBH I don't want the browser to be a platform when there's a platform underneath - I just want it to integrate into the platform underneath. I use an ultrawide monitor and all my IDEs support side-by-side tabs (usually have 2 or 3 to a screen). I wish my browsers could handle this reliably without a buggy extension.